Sort the Grid by any field in ascending (A-Z) or descending (Z-A) order. Learn more. Select a Grid field by simply clicking the field name. Reorder, hide, and show Grid fields. Add and remove Grid fields and List objects. 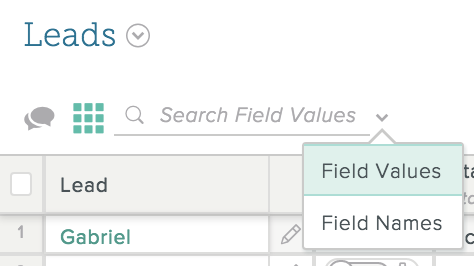 Search the Grid by either Field Values, such as the name of a particular lead, or Field Names, such as a field you add for office locations. To switch between these two options, click the downward-pointing arrow to the right of the Search field and select the option you want. Use hotkeys to copy and paste, as well as perform other functions, in the Grid. Learn more. If you reorder or hide/show a field, this change appears in your Grid view only. It doesn't impact the Grid view that appears to other users. If you choose either of these options, you can easily restore the Grid to its default view. Click the field header once to select the field, and then click again and drag and drop the field header wherever you would like it to appear in the Grid. 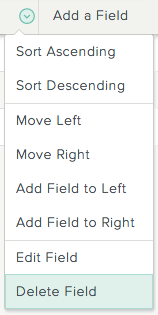 You can use this method to reorder multiple fields at once by holding down Shift before clicking the field headers. To move the field one at the time, click the arrow to the right of the field header and select either Move Left or Move Right. 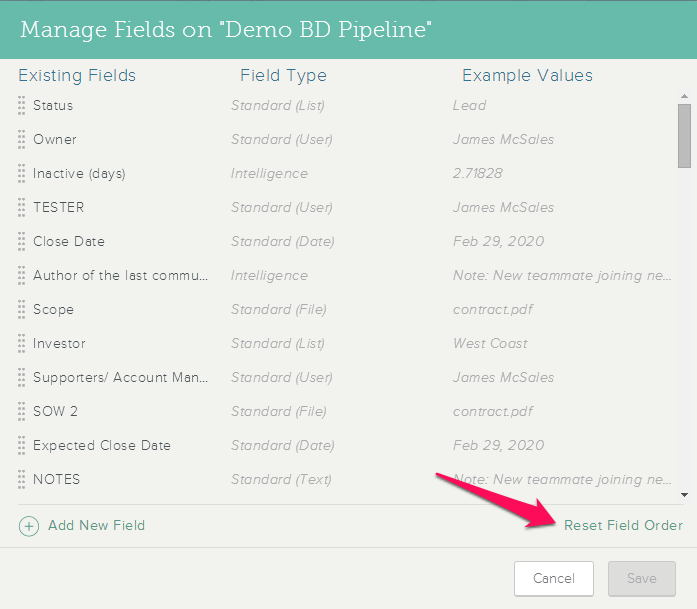 In the Add a Field dialog, click and drag to the left of any field name, and then drag and drop the field wherever you want it to appear in the Grid. In the Grid view, click the arrow to the right of the field header and select Hide Field. 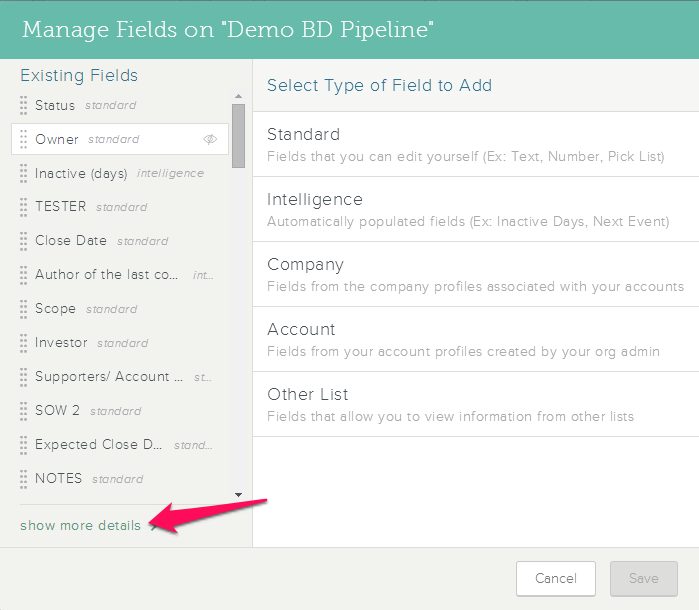 In the Add a Field dialog, hover over any field name, and then click . To show a hidden field, click that appears in the header row where the hidden field is located. Scroll to the far right of the Grid. Click show more details in the lower-left corner of the screen. Click Reset Field Order in the lower-right corner of the screen. 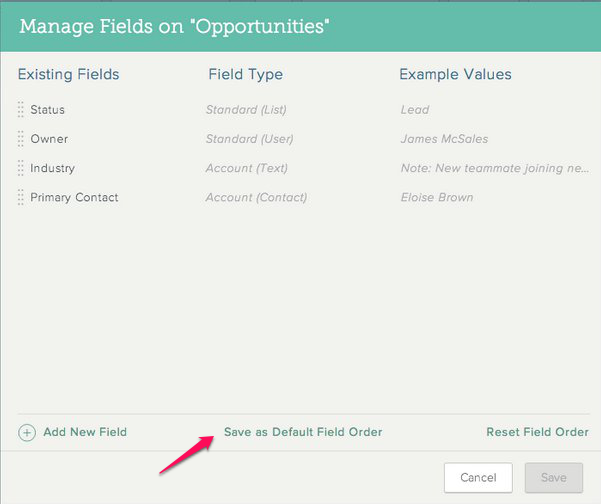 Note: For Organization admins, another option appears at the bottom of the Manage Fields screen: Save as Default Field Order. If other List users reorder or hide fields, they can later revert to the default List order set by the admin. To sort the Grid by any field, click the downward-facing to the right of the field name, and then select Sort A-Z or Sort Z-A. The Grid rows now appear in the sort order you selected. Sorting on a number field arranges the Grid from lowest number to highest (A-Z) or highest to lowest (Z-A). Sorting on a date field arranges the Grid from oldest date to most recent (A-Z) or most recent to oldest (Z-A). 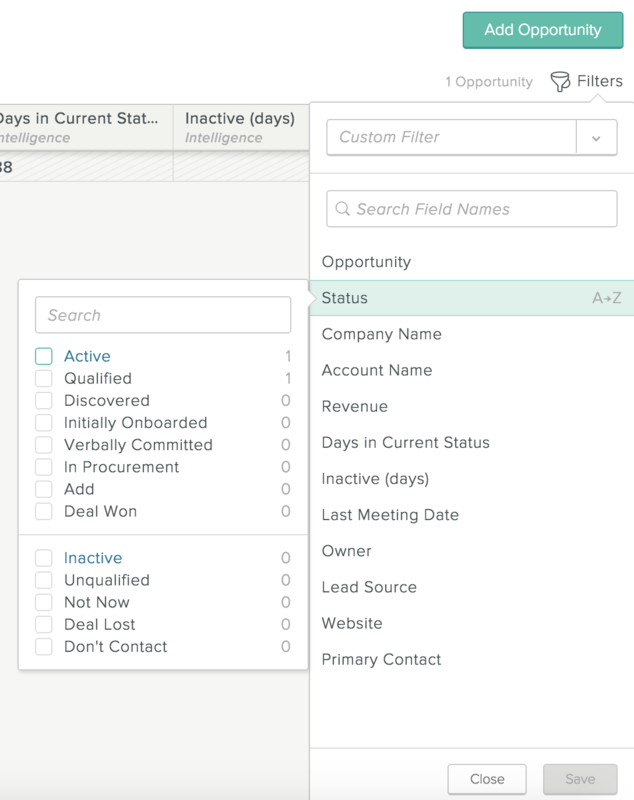 Sorting on the Status field A-Z displays all the entries in Prospect status first (in A-Z order by List object name), followed by all entries in Call status, then those in Deal Won status. Sorting on the field Z-A displays the entries in reverse order (Deal Won, then Call, then Prospect). In this case, within each status, the entries still appear in A-Z order by List object name. 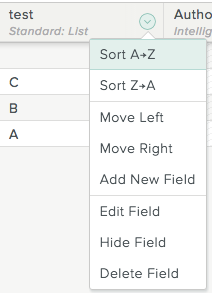 Blank fields always appear at the bottom of the sorted display, whether you sort A-Z or Z-A. A saved filter offers a particular way of sorting and filtering the Contacts and Accounts on a List, such as including only Accounts or Contacts in active statuses versus those that have reached an inactive status. You can save filters and access them across the Grid and Stream List views. Note: You can also filter the Stream view. 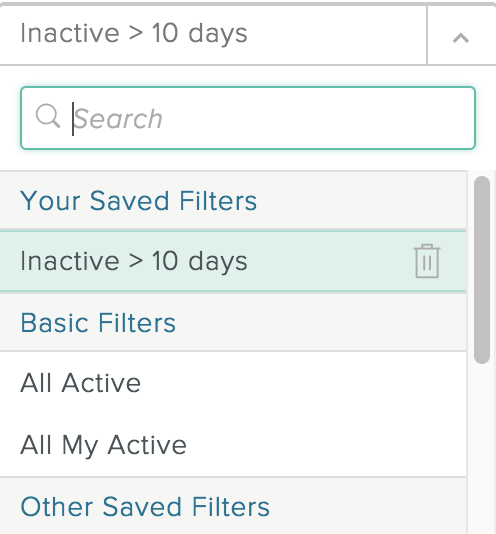 You can use saved filters to easily sort and access the information you want to see. Note: When you add a new field to a List, be sure to check the Enable Filtering box if you want to filter on that field. In the Grid or Stream view, click Filters at the far right of the screen. Search for or browse to the first field you want to filter on. Highlight the field name and select the filter options on the left. 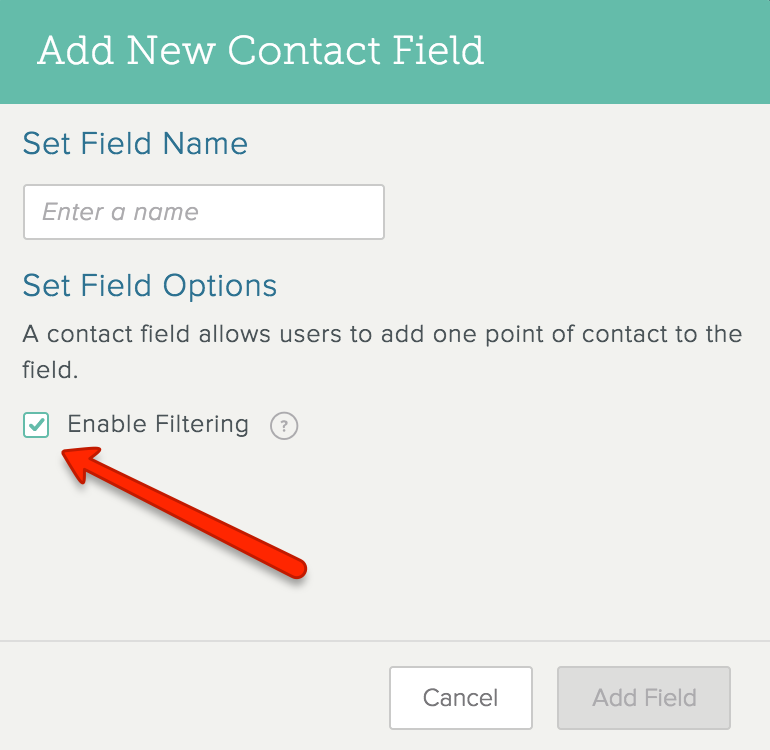 Repeat steps 2 and 3 for any other fields you want to include in the filter view. Click Save at the bottom of the filters panel. Enter a name for the filter and click Save. At the top of the screen, hover over the List you want to filter. The filters for that List are displayed. Note: If the List you want isn't displayed at the top of the screen, learn how to customize the List display. Click Filters at the far right of the screen, and then click the drop-down list at the top of the filters panel. Your Saved Filters—Filters you created. Basic Filters—Default filters for all Lists. These include filtering by All Active statuses and All My Active statuses. Other Saved Filters—Filters created by other user on the List. Search for or browse to the filter you want, and click to apply it. The applied filter appears at the top of the screen, above the Grid or Stream. Note: To quickly filter on one or more List objects, check the boxes to the left of each object name, and then click Filter by Selected above the Grid. To remove one or more options for a field—for example, to remove some statuses from a filter view—highlight the field and uncheck the options to the left. To remove an entire field from the filter view, highlight the field and click Clear to the right. To completely clear the filter view, click Clear All to the right of Filtered By in the filters panel, or click X to the left of Filtered By at the top center area of the screen above the Grid or Stream. 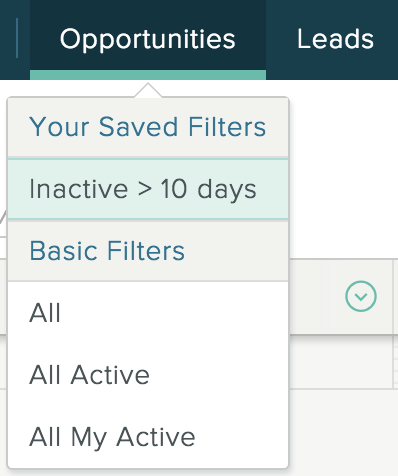 Note: You can also delete any saved filter from the list by highlighting the filter name and clicking to the right. Any collaborator on a List can delete a filter created by any other collaborator. Deleting an object from a List permanently deletes all comments, notes, and manually logged events for that object. No information is preserved. With the List open, click to display the Grid view. Check the box to the left of each object you want to delete. You can select multiple List objects for deletion, or check the box at the top of the List to delete all List objects. In the toolbar that appears above the List, click Delete. You can use hotkeys and keyboard shortcuts to navigate, make edits, and do other work in SalesforceIQ. As the tables below show, you can use these keys in the Grid and Stream views, within an individual Stream item, and in the Snapshot and Fields tab sections within the Stream view.